How to Style Adidas Superstar Men. Adidas superstar shoes are the newest and probably a fantastic sneaker trend that is taking all sporty and western fashion by storm for both men and women alike. Whether you happen to be taking your morning street walk, going to a nightclub or being formally enthusiastic – these superstar shoes will be your smartest worth-the-money fashion guide. And here you can find out why is it so. 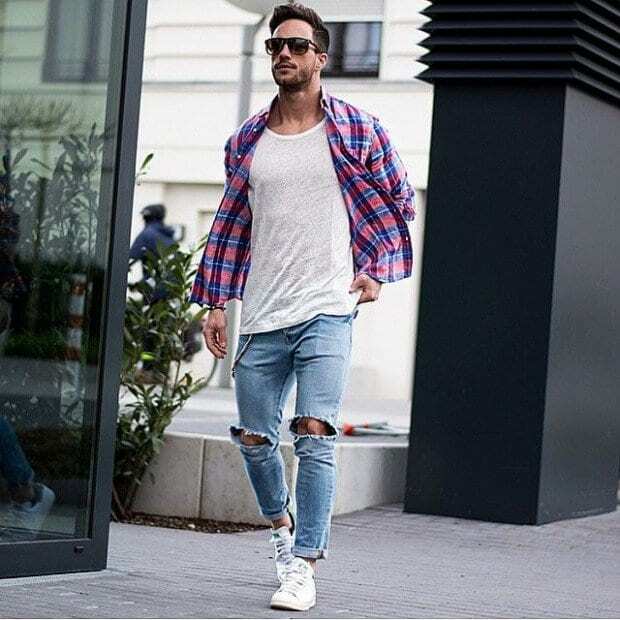 With these 18 amazing outfits that go perfectly with Adidas superstar shoes, you will get you individualistic, desired and creative look with the right amount of formality or casualness that you need for that outfit. For all your mildly formal gatherings, these shoes can match up, and like I said, give you the right amount of class you need. Do check out these Top 10 Men Formal Shoes Styles And Ideas How to Wear them. Even you happen to be dressing your most typically fashionista style, wearing superstars would be totally up to the mark. For a date outfit or a movie night out, superstar Adidas shoes will be a flawless match. In short, they can go possibly with every theme. For all the semi-formal looks that inspire you enough to adopt them. But now’s a chance to take it to not just the next but also a better level, which is with your coolest superstar shoes. Don’t forget the tinted shades. What does not go with a fabulous leather jacket? You can surely pull off an impeccable look with your leather jacket and superstar sneakers. A fancy party is on the way and demands your best look possible. We can assure you that the Adidas sneakers will make any outfit appear prominent and stand it out! With a cool, stylish and comforting winter outfit, own your swag in a tough weather with the best gift of fashion in the current date.